The Junior Minister for Labour Activation said that any employers who abuse the system will be “taken off”. 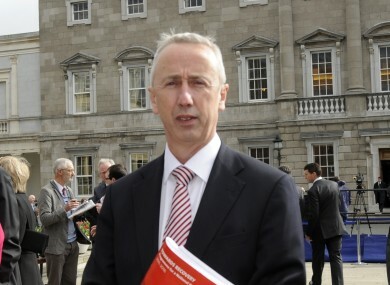 THE RECENTLY APPOINTED Junior Minister with responsibility for labour activation has defended the controversial JobBridge scheme, saying it is “absolutely not” simply a way for employers to get cheap labour. Labour’s Kevin Humphreys said the scheme had been “very successful”, with 64% of participants gaining employment afterwards. Speaking to RTÉ’s Morning Ireland, he stressed the “rigorous enforcement” by the Department of Social Protection of standards that ensure employers do not take advantage of the system. “Employers that abuse the system will be taken off,” he said. The scheme has frequently come under fire for offering internships for unsuitable positions. Last February, a Supervalu store advertised for off license, fresh food, bakery, and butcher interns. He added that another scheme, JobsPlus, has not been utilised enough by employers. Within that programme, the employer receives a subsidy if they hire someone who has been long-term unemployed. The Junior Minister said that a “particular focus” is needed on the long-term unemployed, and also on ensuring that employment is not just in cities. He said that rural towns need to be “revitalised”, a task given to his party colleague Ann Phelan, who has been given special responsibility for rural economic development. ‘While we have to make sure that there is a growing number of people getting back into employment, we have to make sure people aren’t left behind,’ Humphreys said. Last week saw the 25th consecutive fall in the number of people unemployed, down 3,400 to 382,800. The CSO stats published gave Ireland an unemployment rate of 11.5%, down 0.1%. A total of 11,640 people were on labour activation programmes, while 11,338 received Back to Work payments. Email “JobBridge is 'absolutely not' used by employers to get cheap labour”. Feedback on “JobBridge is 'absolutely not' used by employers to get cheap labour”.